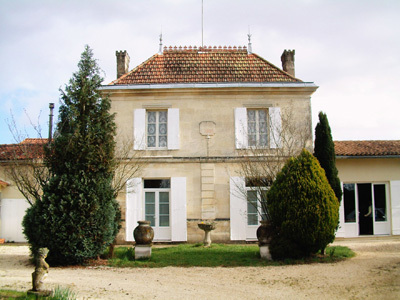 Château Fougueyrat was directed by the family Nicoux till about the millennium, maintaining their very good Saint Emilion status of Grand Cru. The excellent terroir on which the vineyards thrive, testify after all of grand class. A fact that's hard to ignore is that the winery is surrounded by prestigious Grand Cru Classé neighbors as Cap the Mourlin, Soutard, Larmande and Dassault. In 2001 the family Mortelmans acquired the 7 hectares of beautiful situated vineyards along with its cellars. To maintain the Château his status of Saint Emilion Grand Cru, investments were made to keep everything and everybody at the highest standard of quality. The vineyards are situated on the famous lime rock of Saint Emilion and are planted with 85% merlot, 10% cabernet franc and 5% cabernet sauvignon. They were completely lined out again and even partially replanted. Thanks to a double short clipping (vendanges vertes) everything is set to obtain nothing but the highest quality in the vineyards. In the cellars, the alcoholic fermentation can be followed very precisely thanks to small thermo controlled steal containers. The elevation on French oak barrels had been revised as now 1/4 of the oak barrels are renewed every year. The remaining wine ripens in 1 or 2 year old barrels. Annual investing in Château Fougueyrat guarantees it a beautiful future and thanks to its oenoloog Stéphane Toutoundji (Château la Serre, Château la Pointe, …), one knows how to handle the most innovative techniques. Today it can compete with the best Grand Cru wines and even the Grand Cru Classé wines. Dare it dream of its status that was achieved in 1949: "Grand Premier Cru Classé" !!! Thanks to the large presence of merlot Château Fougueyrat is a wine that can be uncorked very young, but can also mature several years in a cellar. 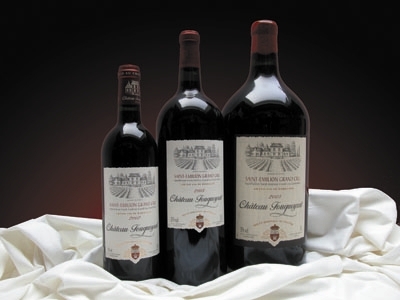 Exceptional years like 2000 & 2005 can even obtain possibly 20 years of cellar maturation. Château Granchamp is labeled as 'small brother' but is originating from 1.5 hectares beautiful situated vineyards in Montagne Saint Emilion. The merlot (100%) grapes are grown on one single plot consisting out of mainly lime underground with an upper layer of clay. This wine gets exactly the same treatment as Château Fougueyrat.